I was recently lured into viewing an article on a series of photographs French artist Alain Delorme compiled that turned out to be bogus. The article was titled "Look At These Chinese Workers Carrying Mind-Blowing Amounts Of Stuff" but it turned out the images were all fakes created in photoshop. 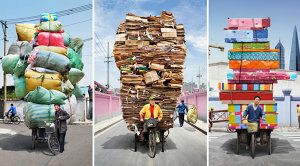 Turns out, Paris-based Delorme creates these spectacular towers of boxes, tires and blankets using Photoshop. As he exaggerates reality by meticulously stitching together the image, he tries to confuse the line between what is fake and what is real, and raise questions around the limits and rules of documentary photography. "Even pictures covering a story are retouched to look cleaner, more beautiful," he writes in an e-mail. "What are the limits when the search for perfect aesthetics hides a part of reality?" Delorme alters the photos with Photoshop to exaggerate the loads his subjects carry and heighten that sense of consumption. "To what extent can we play with reality to get the viewer to ask questions?" He says the works investigate globalization and consumerism. "But it is above all a way to make people think about the consumer society we live in via the ‘Made in China’ phenomenon, with all its identical and exchangeable objects produced in big quantities." Why is it critics of globalization avoid coming out and saying what they mean? Globalization is the extension of human cooperation across international borders and protectionists like Delorme rarely say they oppose it, but claim their propaganda makes people "think" about the issue or study it. Bottom line, when you have to lie to people to make your point the way Delorme did with his fake images you are admitting your case is weak.